state transport buses is the great media to target semi urban & rural india state transport buses which travel across the state, covers city-urban-rural, if your target group is semi urban & rural then go ahead with this medium. Bus advertising is a popular way for advertisers to reach the public in metropolitan areas. Ads are placed externally, placards known as "boards" can be placed on the front, sides, and rear of a bus. Kukku Smart Attendant Cehthsol Pvt. Ltd.
City Buses are a prime mode of transport in major cities. A large number of people use them for their daily transport needs. 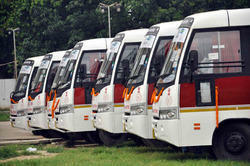 Henceforth buses have also become a commonly used medium for advertisers to spread their message. We are Bus Advertising Service provide. Leveraging on our huge industry understanding and knowledge, we are providing Complete Bus Exterior Branding Services that is broadly used for several sectors. These provided services are delivered by well-trained professionals as per set industry guidelines. Due to its perfection and promptness, this service is broadly valued by our clients.